Our last day in Halifax was amazing. The weather (one day prior to Tropical Storm Irene making her arrival) was perfect – 28 degrees and sunny with not a breath of wind. We had another delicious breakfast in the restaurant at the Courtyard Marriott and did a bit of shopping for souvenirs along the harbor. 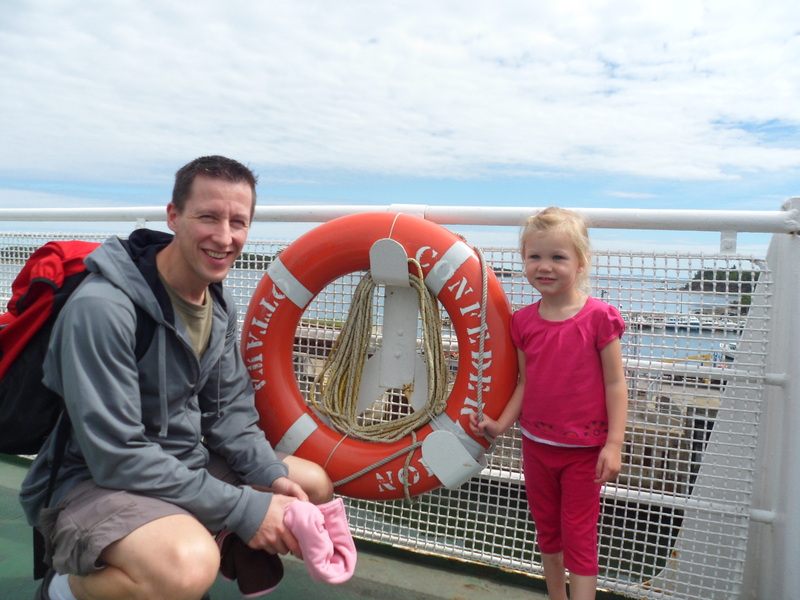 Sydney and I signed up for the 12:30 departure on the Theordore Too Tugboat. Sydney was very excited to go for a ride and it was $15 for me and $10 for her to go on the 45 minute adventure. 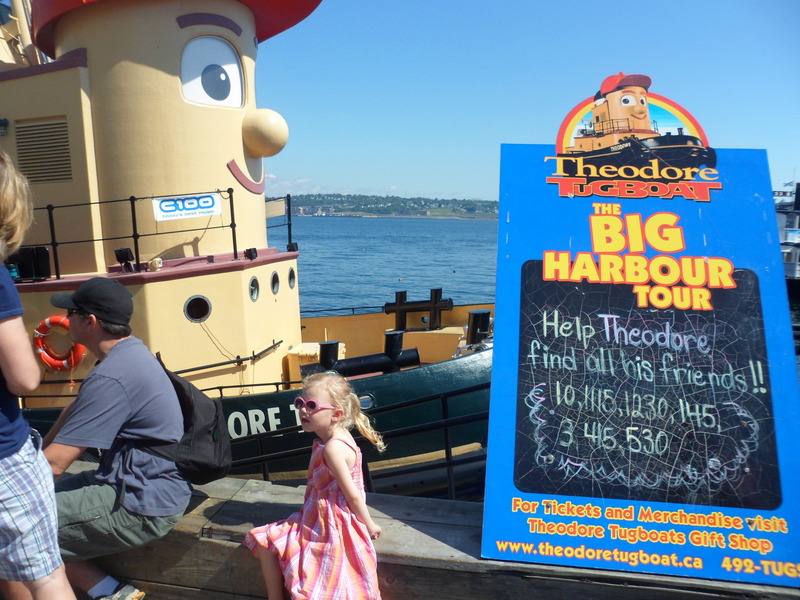 The staff were great with kids – they gave them a picture to color that had all of Theodore’s “friends” that we would see in the harbor and gave all the kids a “crew” certificate at the end. It was well worth it! When we got off, we had another lunch from the stands along the harbor – there is lots of choices from fish and chips to hot dogs to wraps, plus donuts, ice cream, etc for desert. It’s was great to eat outside on a nice day. There were some very nice sailboats and yahts in Halifax Harbor as they were expecting the hurricane to hit the next day and the ships were docking there until the storm was over. We wandered around looking at the beautiful boats and enjoying the day. We had planned to take a tour of Alexander Keiths, which was beside our hotel, but when we showed up for their 5pm tour, they informed us they had stopped tours at 4pm that day, due to a private event. Shoot! Next time! Our flight home on Sunday morning was early – at 7:25am. Halifax airport is about 30-45 minutes drive from downtown, so we left our hotel at 5:30am – ouch! We were given a wrong exit by the hotel front desk, but after a 3 minute detour, were back on our way and made it to the airport in lots of time. The check in lineup was a little long, but be breezed through security with no delays. Our flight from Halifax to Calgary was slightly delayed due to headwinds, but we had quite a long layover, so it was no problem for us. Our flight from Calgary to Saskatoon was on time and overall everything went perfectly. It was one of the best holidays I’ve taken in a long time and the Maritimes should definitely be on your list of places to see, if you haven’t made it there yourself! After our busy day on the Cabot trail, we had an early start out on our trip to PEI. 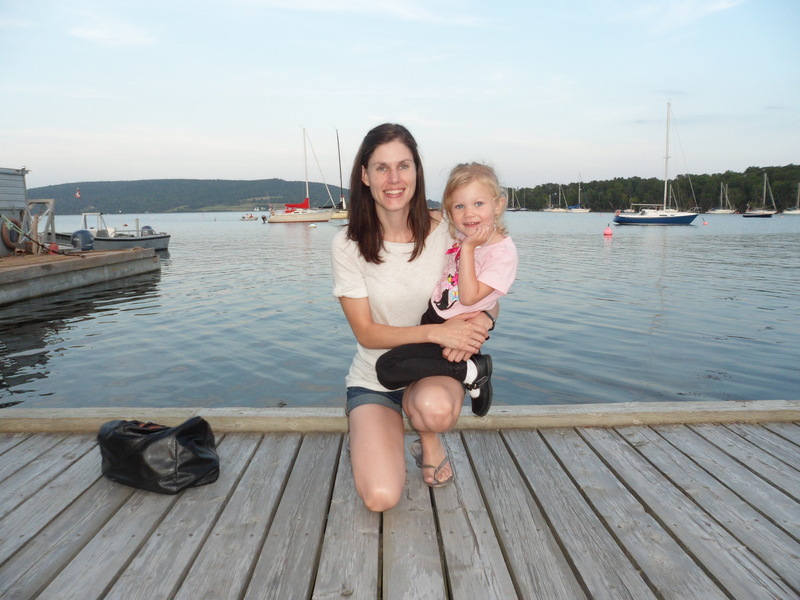 It was a couple of hours to drive from Baddeck to Pictou to catch the Woodlands ferry. The ferry (and Confederation Bridge) are free to go to PEI, but they charge you when they leave the island. We caught the 1pm ferry to PEI. It takes 75 minutes to cross and it was a calm, hot, sunny afternoon – very enjoyable! We drove from the ferry to the town of Souris when we arrived. This took around 1 1/2 hours and gave us a good overview of PEI – VERY quaint and charming. Not a lot of “towns” as we think of them – more rural with many farm houses along the way. The yards and houses, for the most part, were very well taken care of and it was a nice drive. We were impressed with how clean, well tended and safe everything seemed. We arrived at our destination – the “Lighthouse and Beach Motel” in Souris. This was advertised as a two bedroom housekeeping suite at a motel that was right near the beach for $105. It was a quick 1-2 minutes drive to a beach, but the hotel itself was quite run down. The owners had obviously done what they could to make quick repairs and it was very clean, but the floor was very uneven and had a hump in the middle – the roof was all sloping and looked like it could come down at any moment and the bathtub surround was made of left over vinyl flooring and left over wood baseboards. It left a bit to be desired, plus it was obviously a very old property. It was ok for one night and we had a nice seafood dinner of lobster, mussels and shrimp at the Bluefin restaurant in the town of Souris (not to mention the lemon pie was to die for). However, we decided not to stay for our second night at the motel. The owners were kind enough not to charge us a cancellation penatly. 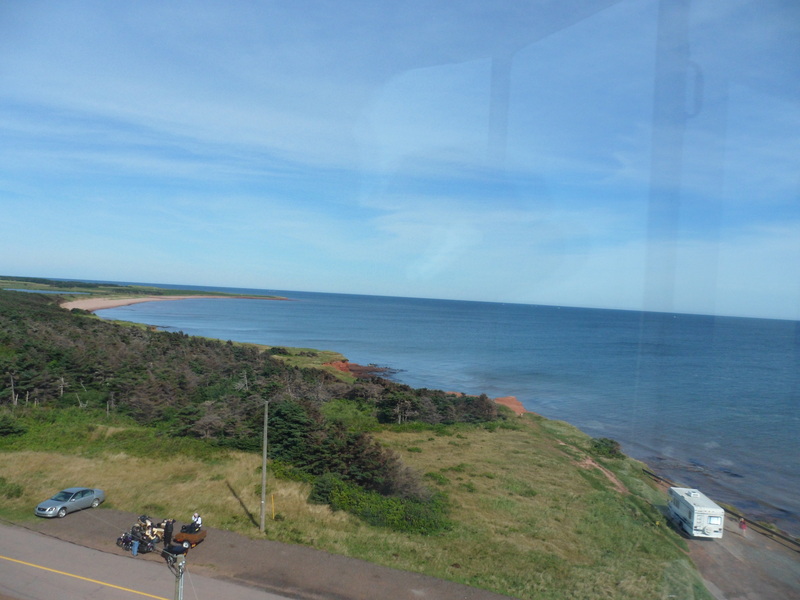 Instead, we drove the Eastern/Northern Coastal Route to Charlottetown for our second night in PEI. On our way, we stopped at the Points East Lighthouse (built in the late 1800’s – they charge $5 per adult, kids free) and then for lunch in St. Peters – a quaint town on a nice bay – Fish and chips at Ricks Place, which was decent. We arrived in Charlottletown early afternoon and our hotel room wasn’t quite ready at the Best Western Charlottetown, so we drove to Victoria Park and found a nice play area and splash park to occupy Sydney for an hour. It was another beautiful, sunny day and downtown Charlottetown is full of historic old buildings and interesting people. After checking into our hotel, we walked around the downtown area, shopping and having coffee and enjoying the old buidings and harbor scenery. The Best Western was renovated last year, has a pool and free parking and continental breakfast. I enjoyed our stay there and would recommend it if you are in the Charlottetown area – about 4 blocks to walk to the harbor and within walking of lots of shopping and restaurants. 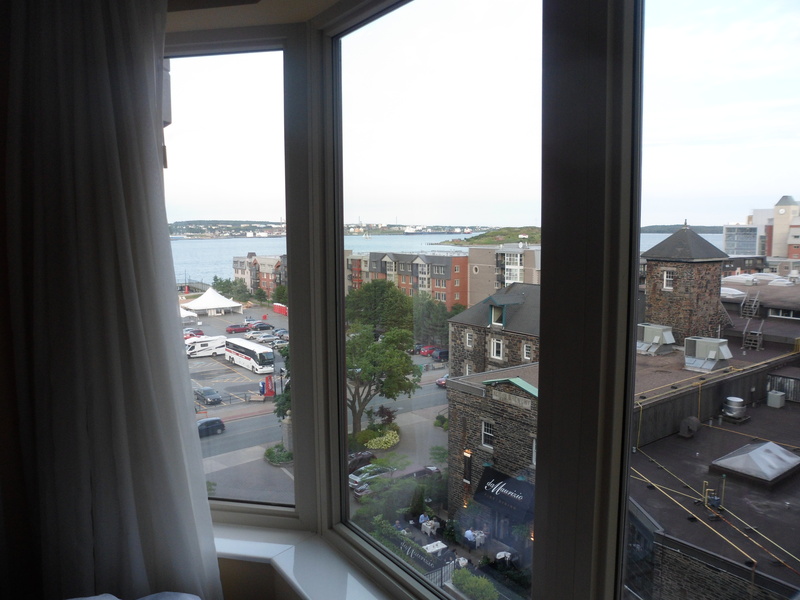 Charlottetown was busy this week and the hotel was almost sold out, so we paid $154 a night. The usual rates would start around $120-$130. 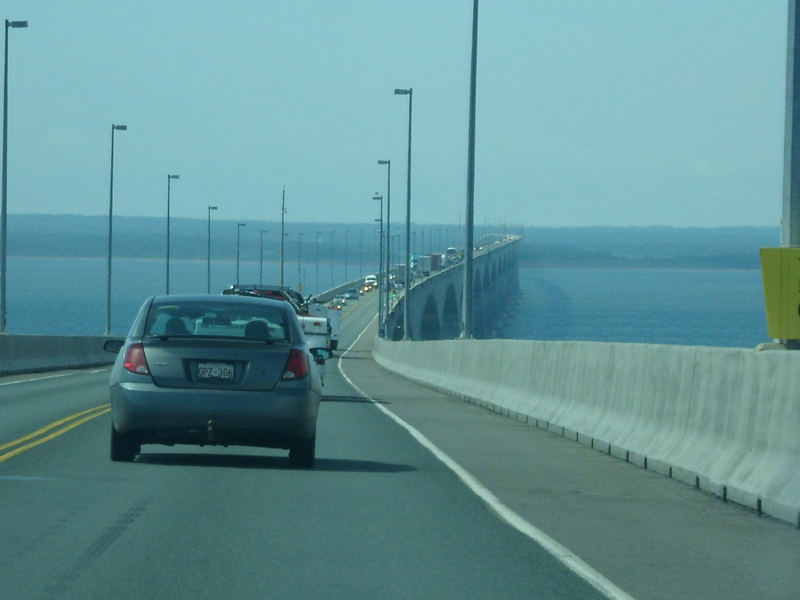 This morning, we drove from Charlottetown to Halifax via the Confederation Bridge. It took about 5 hours and the toll to cross the bridge was about $45.00. 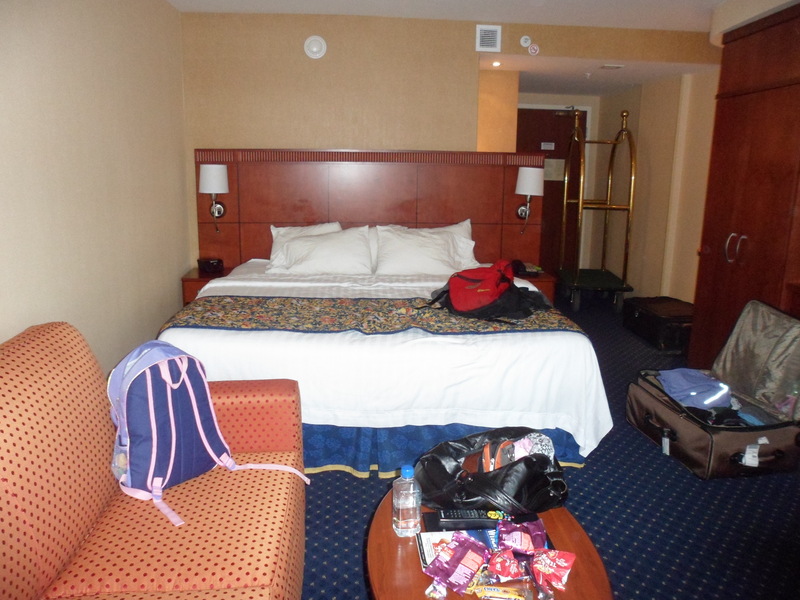 We arrived back at the Courtyard Marriott late afternoon and our room is much the same – spacious king with a sofa bed and a nice renovated room – nice bathroom and great view of the harbor. We met friends for dinner at the Warehouse restaurant accross the street and had an awesome seafood pasta dinner – one of the best meals we’ve had here. It was (again) a beautiful, calm, warm evening. We have really lucked out with the weather and have had such a nice holiday. Tomorrow, we hope to go on the Theodore tugboat, if weather permits, do some shopping, take in the Alexander Keiths Tour and possibly the Citadel and then get ready for our very early morning flight home on Sunday (just in time to miss Hurricane Irene, which is due to hit on Sunday night or Monday morning). We’ll be sad to leave, but have really enjoyed our quick tour of the Maritimes. I’m sure we’ll be back again one day! We stopped at the famous “Red Barn” on the highway beside Baddeck for an early supper of fried shrimp and seafood chowder – delicious! Then it was off to visit a friend in Margaree Center (or was it Margaree Valley, East Margaree, etc, etc – a LOT of Margarees!). We got a little lost, before a nice local lady informed us everything on the island goes in circles – no kidding! Eventually we found her place and had a nice evening over a bottle of local wine and good company. 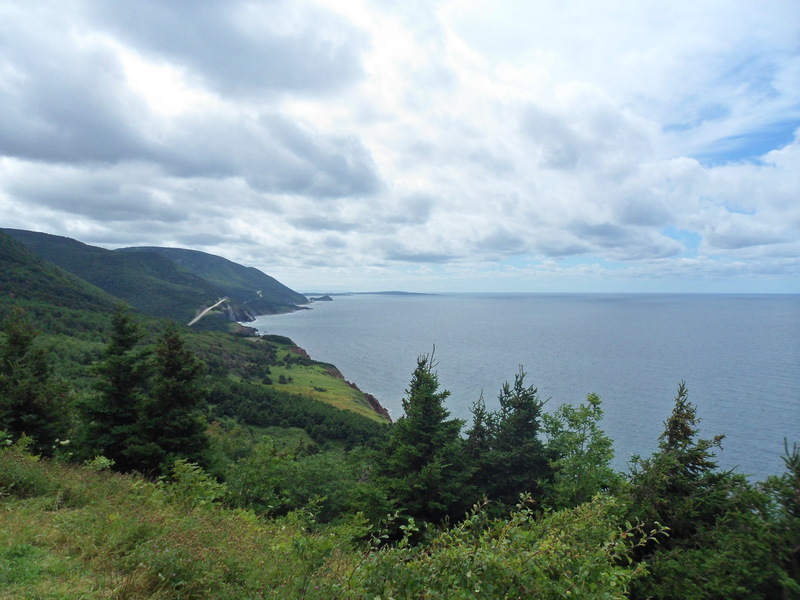 Today was a very full day spent on the Cabot Trail – 10am – 7pm. It is a gorgeous drive and despite my initial apprehensions over travelling such a long day with a 3 year old, we had a great time. We stopped lots for pictures and to stretch our legs, had a nice lunch at Giselle’s in Cheticamp, went on the Bog hike, which is nice for little guys as it’s all on a boardwalk over a bog on the top of a mountain, then stopped to do some fishing at a local’s stocked trout pond. Sydney helped catch her first fish and had so much fun. We just made it back to our comfy cottage and have our fish cooking on the BBQ! Tomorrow, we’re off to PEI for a couple of nights via the Ferry. After a good first night in Halifax, we had a bit of a sleep in and relaxing breakfast in the hotel restaurant, the Courtyard Cafe. The food was good, reasonable and they had a nice, extensive kids menu. The Courtyard by Marriott is definitely on my recommend list for being in an excellent location, comfortable, great service and family friendly. They have valet parking for $20 or self parking downtown Halifax is about $2.50 an hour. We did the valet parking and they were very quick and efficient at picking up and dropping off the car. 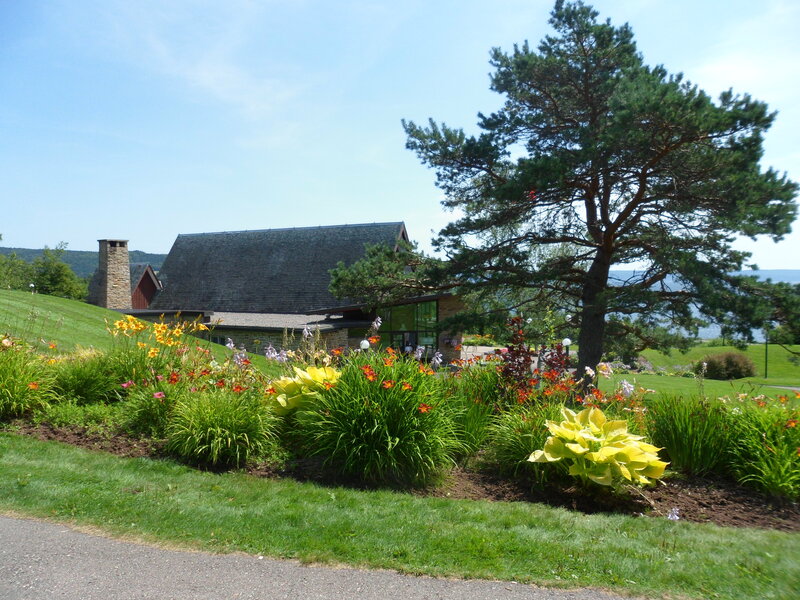 We drove to our next home on Sunday – the Hunters Mountain Chalet’s about 10 minutes from the charming town of Baddeck – which is at the beginning of the Cabot Trail. The drive took us just under 5 hours, including one stop for lunch and one stop for gas. It’s an easy, scenic drive and another bright, sunny day. When we arrived at the Hunters Mountain Chalet’s, we were pleasantly surprised. Our chalet has two big bedrooms, a living room with electric fireplace, dining table, small kitchen and private bathroom. 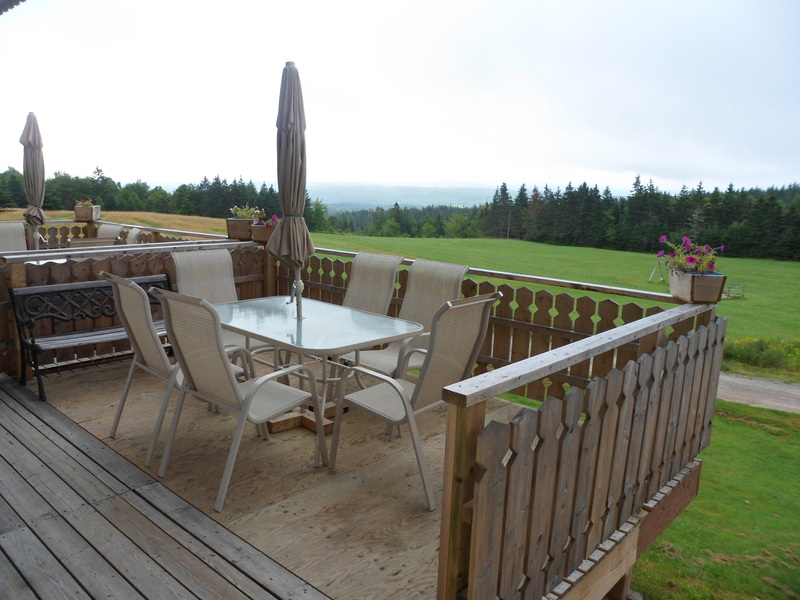 There is also a big deck with table, chairs and BBQ out front. The property isn’t lakefront, but has a small view of the water in the distance. The chalet’s are partway up Hunter Mountain, have rolling green lawns and a play structure, which is perfect for Sydney to run around after being cooped up in the car. There are also about a half a dozen hiking trails on the property – anywhere from 20 minutes to 2 hours and varying in difficulty. We plan to check out a few before we go. The chalets are quaint and comfortable and EXCEPTIONALLY clean (this means a lot coming from someone who is a little OCD in the clean department!). After unpacking a bit, we drove the few minutes into town for a few groceries, as we would like to have breakfast at our chalet so we don’t have to rush out in the morning. We took a quick tour around town and enjoyed the scenery, then had a pizza at Tom’s pizza place on the main street – all fresh and home made to order – delicious! We had a nice leisurely stroll around town after – lots of nice little shops and a great marina/boardwalk for walking around. The chalets were a delight in the evening – no traffic, no noise, no street lights – a great sleep for everyone and the second morning in a row that Sydney has slept till 9am!!! Thanks to the generosity of Westjet, the three of us found ourselves in the predicament of having some free airline tickets and having to pick a place to go for our summer vacation. Mark decided on Halifax and a mini-tour around the Maritimes. Having been here once before, I was more than happy to come back and spend some more time. It’s a beautiful place to be in the summer! So, at 5am this morning, a taxi whisked us off to Saskatoon airport for our 615am flight to Halifax, with a 4 hour layover in Toronto en-route. The airport was really busy, both at check in and at security, but we made it to the gate as the final boarding was being called. With 10 flights taking off between 540am and 700am, the early morning hours at the Saskatoon airport are busy – make sure you leave lots of time! Some key points to remember when travelling with kids that make travelling easier: sippy cups to avoid spills on the airplane, tons of activities for them to do (coloring, stamps, stickers, books, movies, etc). I also find it helpful to tuck away a few “surprise items” for those moments when you urgently need a diversion (to ward off a meltdown, or make someone forget a boo-boo – you will know these moments when you see them!). A few special “surprises” help to make things better before you get too far off course – dollar store items are good for this. We had a four hour layover in Toronto on the way and we decided to use the Premium Plaza Lounge. It’s approximately $20 a person, children free, if you buy it from us ahead of time. If you walk in, it’s about $35 a person. Considering, they include food, drinks and a quiet, safe place for you and your kids to hang out for up to four hours, it’s a great deal. There were only about 4 or 5 of us in there the whole time, so we had a whole area to ourselves and didn’t have to worry about Sydney running away or getting lost in the crowd. The flights, were all in all great – on time and no problems. We booked our car rental with Hertz and it was ready when we got there and they were quick at getting us in and on our way – including maps and point to point directions to our hotel. For the nights we are in Halifax, we will be at the Courtyard by Marriott on Salter Avenue. The staff is friendly, the rooms are very comfortable, nice and clean – big bright, reno’d bathrooms. The location is excellent – right behind Alexander Keiths and a very short stroll to the dock/wharf area. The only negative comment I have, is the pool could use a little TLC. We walked to the dock whe we arrived, around 7pm and for $30, all three of us stuffed ourselves on home made, fresh battered fish and chips, which were excellent – and the view couldn’t have been better! 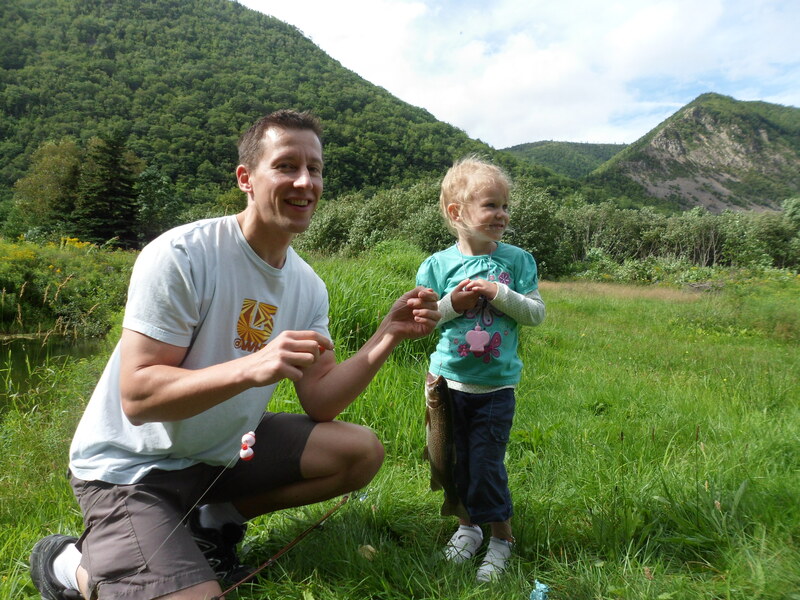 Tomorrow, we’re heading to Cape Breton, which I’m looking forward to as it was a favorite the last time I was here. We’re crossing our fingers for good weather and no rain!